For the asteroid, see 74 Galatea. Galatea (/ˈɡæləˈtiːə/ GAL-ə-TEE-ə; Greek: Γαλάτεια), also known as Neptune VI, is the fourth-closest inner satellite of Neptune. It is named after Galatea, one of the fifty Nereids of Greek legend, with whom Cyclops Polyphemus was vainly in love. 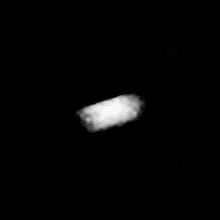 Galatea was discovered in late July 1989 from the images taken by the Voyager 2 probe. It was given the temporary designation S/1989 N 4. The discovery was announced (IAUC 4824) on 2 August 1989, and mentions "10 frames taken over 5 days", implying a discovery date of sometime before July 28. The name was given on 16 September 1991. Galatea is irregularly shaped and shows no sign of any geological modification. It is likely that it is a rubble pile re-accreted from fragments of Neptune's original satellites, which were smashed up by perturbations from Triton soon after that moon's capture into a very eccentric initial orbit. Galatea's orbit lies below Neptune's synchronous orbit radius, so it is slowly spiralling inward due to tidal deceleration and may eventually impact the planet or break up into a new planetary ring system upon passing its Roche limit due to tidal stretching. Galatea appears to be a shepherd moon for the Adams ring that is 1,000 kilometres (620 mi) outside its orbit. Resonances with Galatea in the ratio 42:43 are also considered the most likely mechanism for confining the unique ring arcs that exist in this ring. Galatea's mass has been estimated based on the radial perturbations it induces on the ring. ^ Surface gravity derived from the mass m, the gravitational constant G and the radius r: Gm/r2. ^ Escape velocity derived from the mass m, the gravitational constant G and the radius r: √2Gm/r. ^ Jacobson, R. A.; Owen, W. M., Jr. (2004). "The orbits of the inner Neptunian satellites from Voyager, Earthbased, and Hubble Space Telescope observations". Astronomical Journal. 128 (3): 1412–1417. Bibcode:2004AJ....128.1412J. doi:10.1086/423037. ^ a b Showalter, M. R.; de Pater, I.; Lissauer, J. J.; French, R. S. (2019). "The seventh inner moon of Neptune" (PDF). Nature. 566 (7744): 350–353. doi:10.1038/s41586-019-0909-9. ^ a b Karkoschka, Erich (2003). "Sizes, shapes, and albedos of the inner satellites of Neptune". Icarus. 162 (2): 400–407. Bibcode:2003Icar..162..400K. doi:10.1016/S0019-1035(03)00002-2. ^ Williams, Dr. David R. (2008-01-22). "Neptunian Satellite Fact Sheet". NASA (National Space Science Data Center). Retrieved 2008-12-13. ^ a b Porco, C.C. (1991). "An Explanation for Neptune's Ring Arcs". Science. 253 (5023): 995–1001. Bibcode:1991Sci...253..995P. doi:10.1126/science.253.5023.995. PMID 17775342. ^ a b c "Planetary Satellite Physical Parameters". JPL (Solar System Dynamics). 2008-10-24. Retrieved 2008-12-13. ^ Marsden, Brian G. (August 2, 1989). "Satellites of Neptune". IAU Circular. 4824. Retrieved 2011-10-26. ^ Marsden, Brian G. (September 16, 1991). "Satellites of Saturn and Neptune". IAU Circular. 5347. Retrieved 2011-10-26. ^ Banfield, Don; Murray, Norm (October 1992). "A dynamical history of the inner Neptunian satellites". Icarus. 99 (2): 390–401. Bibcode:1992Icar...99..390B. doi:10.1016/0019-1035(92)90155-Z. ^ Namouni, F.; C. Porco (2002). "The confinement of Neptune's ring arcs by the moon Galatea". Nature. 417 (6884): 45–7. Bibcode:2002Natur.417...45N. doi:10.1038/417045a. PMID 11986660. Wikimedia Commons has media related to Galatea (moon).